Esophageal atresia (EA) is a congenital condition (present at birth) in which the esophagus is interrupted and fails to connect the mouth to the stomach as it should. The upper part of the esophagus ends in a blind pouch, and, in the most common form, the lower esophagus connects the airway (trachea) to the stomach (a trachehoesophageal fistula, or TEF). These conditions (EA and TEF) can occur separately, but most often occur together. Babies with EA, TEF, or EA-TEF must undergo surgical repair, often very soon after birth. Without treatment, attempting to eat could cause babies to aspirate milk and stomach acid into the trachea and lungs. 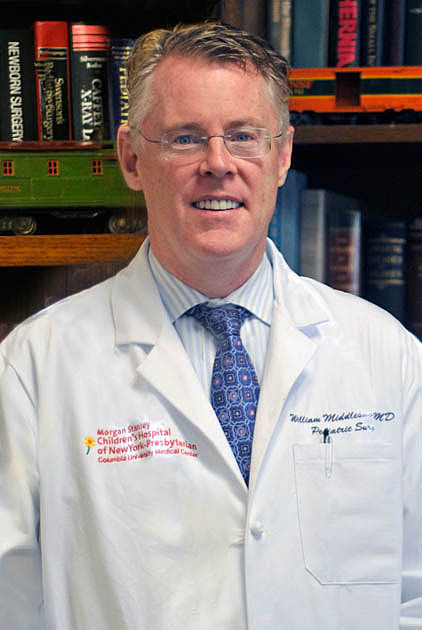 According to William Middlesworth, MD, a pediatric surgeon at NewYork-Presbyterian Morgan Stanley Children’s Hospital and Surgical Director of the Esophageal Atresia Program, clear surgical guidelines are in place regarding how to best restore continuity of the esophagus and separate it from the trachea. Since the first repair in 1945, surgery has been successful in the vast majority of children, and mortality has significantly declined. Dr. Middlesworth and colleagues at NewYork-Presbyterian offer minimally invasive surgical options for EA repair in appropriately selected patients. When appropriate, they repair esophageal atresia using a thoracoscopic approach, which entails three small incisions in the chest for a surgical camera and instrumentation. While a successful operation is the first step, it is now recognized that children do best when they receive careful long-term follow up. Surgery corrects the abnormal anatomy, connecting the ends of the interrupted esophagus and separating it from the trachea, but not the physiology (function) of the esophagus. Dr. Middlesworth and his colleagues recognize that children with EA need to be monitored as they grow and develop, even in the absence of any obvious clinical symptoms. One of their top concerns: acid reflux. Although they may be unaware, most children born with EA have some degree of acid reflux, which can lead to problems years after surgery. More accurately, what is understood as reflux is really a form of dysmotility (impaired clearance) of the esophagus, according to Dr. Middlesworth. Children with EA-TEF are at risk for formation of strictures, or narrowed spots, where the interrupted esophagus was sutured together. Strictures can also form in the esophagus due to inflammation caused by acid, explains Julie Khlevner, MD, a pediatric gastroenterologist who specializes in diagnosing and treating patients with gastrointestinal motility disorders. Dr. Khlevner is Director of the Pediatric Gastrointestinal Motility Center at Morgan Stanley Children’s Hospital of NewYork-Presbyterian and Medical Director of the Esophageal Atresia Program. Both strictures and impaired esophageal motility can result in food and stomach acid lingering in the esophagus, which is not equipped to handle it. As readers may already know, prolonged acid reflux can lead to Barrett’s esophagus, a dangerous precancerous condition. “Despite having treated this condition for over 75 years, doctors have not been able to develop and agree upon clear guidelines regarding the best way to monitor and treat children born with EA or EA-TEF,” says Dr. Khlevner. There is no evidence-based protocol to follow, because adequate studies have not yet been conducted in the relatively small number of patients affected by this rare disease. Without such evidence to guide them, individual doctors are left to use their best judgment in choosing mild acid suppressant medications, aggressive acid-reducing medicines, medications to improve motility, dietary recommendations, and anti-reflux surgery (such as Nissen fundoplication). As many as half of children may require interventional procedures to dilate strictures in the esophagus. “Medications for reflux can have serious side effects such as increased risk of C. difficile infection, respiratory infection, and bone loss,” says Dr. Khlevner. “We want to prevent reflux without doing damage with these drugs.” Or, as Dr. Middlesworth phrases it, “We need to manage these patients in a way that will keep their esophagus healthy not just for their first 18 years, but their first 80 years.” Many questions remain unanswered, such as whether children need to take medicines for the rest of their lives, whether mild or aggressive medications should be used, how frequently such children need to be monitored, and when surgery should be considered to treat reflux. Conducting longitudinal clinical research in order to develop best-practice treatment protocols. Drs. Middlesworth and Khlevner now monitor children using endoscopy and impedance/pH studies to assess whether the esophagus is inflamed and to see if too much acid is present in the esophagus. This can help guide antireflux therapy and help avoid both over-treatment and under-treatment. To learn more, visit http://childrensnyp.org/mschony/digest-tracheo or call 212.342.8586.